Right now I feel a storm of emotions inside me as I reflect upon this unforeseen and unofficial nine-month hiatus I took from my blog. Nine. Friggin’. Months. Man. What reason did I have? It’s not like I was pregnant or something (I thought about creating a fake baby but it got creepy really quickly when I tried to mix Daniel Craig‘s face with mine). So what new life have I birthed, in the figurative sense, this past 3/4 of a year? No, I didn’t go on an “Eat Pray Love” journey or take time to revamp my blog. But I did travel a ton. Met amazing people. Stretched my view and understanding of the world. Ate incredible food. Gathered more fodder for the funny stories farm. Mourned the death of a beloved character on The Walking Dead. Attempted to destroy a demonic cilantro plant. And so from these experiences, in this context of my blog, shouldn’t there be something justfiveletters can bring to the world? Shouldn’t I have a Simba to show you on Pride Rock? Or burst out of the cocoon as a beautiful butterfly? No, I hate butterflies. They make the hairs on my skin rise like most non-human creatures. I change my metaphor to…a pie. Yes, shouldn’t I be a magnificent pie coming out of the oven, luring you with my sweet aroma? Sadly, I come back from my hiatus with no great revelation, and no particularly valid excuse for my absence. Most things that happened in this “gestation” period are too serious for this context anyway (God continues to grow me and change my life blah blah blah). But take me back, because it’s time again. Yes, come closer. Put your arms around me. Hold me. Okay, let go now. Dude seriously, get off me. This is Amy Hu signing off for March 18, 2014. 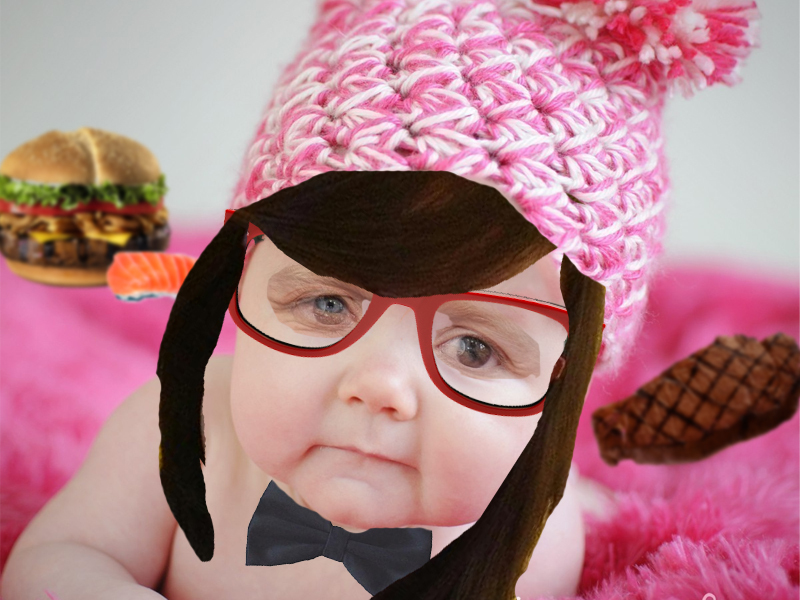 I like the cheeseburger hanging out behind your baby. I’d love to read about the “blah blah blahs” of how God has been changing you!